Americans, who tend to shun both the specific and the historical, are today celebrating Veteran’s Day in one great, glorious outburst of fuzzy good feeling towards the men and women who have served in our armed forces. At school yesterday, during morning announcements, our elementary students were exhorted to give a veteran a hug if they should come upon one, but when I later asked a group of third and fourth graders what exactly a veteran was, they told me, after a good deal of squirming, that they weren’t sure, but perhaps a veteran was a hero who saved us from bad guys. A simple answer, the answer of a child, but how many American adults know much more than that about the holiday that is Veteran’s Day? In fact, November 11th marked a specific end to a specific period of carnage that we now call The First World War. Those who took part in this carnage, who survived it, called it The Great War, or The War to End All Wars, for in their innocence and exhaustion, they could not imagine that there would be another even more terrible war in a little over two decades. Ninety-six years ago, on November 11, 1918, “at the eleventh hour of the eleventh day of the eleventh month” a peace was signed and the guns finally stopped firing. The news, however, did not penetrate to the front lines immediately. One of the greatest novels to come out of this war, Erich Maria Remarque’s All Quiet on the Western Front tells the story of a German soldier who was killed a few minutes after the armistice was signed, after the guns were supposed to have gone quiet. The early days of November are rich in momentous anniversaries. Another great event, an event which happened as a result of and during The First World War, was the Great October Revolution in Russia. No, I haven’t got my months wrong. In those days, in 1917, the Russians still used the Old Style calendar. October 25th in Russia was November 7th everywhere else. This Revolution, no matter what your view of the results, occurred for good reasons. The mighty Russian Imperial machine had broken down under the strain of the war. In the Russian trenches, soldiers went without food and were sent into battle with inferior weapons or no weapons at all. Back in the streets of Petrograd, there was no bread. There had actually been a revolution before the October Revolution, a February Revolution. The Liberals who took over the Russian Government in February 1917 had not taken Russia out of the First World War. It was their intention to do everything they could to keep fighting. The Germans, whose resources were being increasingly strained from fighting a war on two fronts, rounded up the charismatic Bolshevik leader Lenin from his exile in Switzerland, put him on a train, and sent him back to Russia. It was their belief that should Lenin succeed in taking power there, he would sign a separate peace in the East. Lenin did take power, and he did sign this peace. It didn’t save the Germans though. Their country too eventually crumbled under the strain of the war and the conditions of the peace treaty they were forced to sign at Versailles in 1919 were so onerous that it brought their country to near revolution and ultimately to popular support for a charismatic leader called Hitler who promised to stop Bolshevism and to raise Germany to its former glory. That Hitler did more than this, most of us know. That he invaded and exterminated and just generally made living (and dying) a hell for millions of people in Europe is one of the few facts of history most Americans are pretty clear on. But the main thing he did was over-reach in attacking Russia (as Napoleon had done before him) and in 1945 the advancing Russians flooded back into Germany and after the guns stopped firing, they stayed. When I lived in Germany in the late eighties, it was generally understood that the part of Germany the Russians stayed in, East Germany, or the German Democratic Republic, was the part of Germany that had paid the real price for the German sins of the Second World War. All of Germany had been destroyed and conquered, of course, but the western side had been rebuilt with American money and the eastern side had not. Instead, the Russians and the local German Socialists had teamed up to create a “workers’ and peasants’ paradise.” Except it wasn’t. A lot of Germans left the East as it became apparent that the German Democratic Republic wasn’t going to be particularly democratic. They snuck over the border under cover of darkness, they hid in trains. Up in Berlin, they went over to the West for the day and never came back. In 1961, it got so bad that the East German authorities built a wall to stem the tide. This wall stood for 28 years and fell on November 9, 1989, which brings me to my third November anniversary. This year is the twenty-fifth anniversary of the fall of the Berlin Wall. It is an anniversary which I take most personally since I crossed the German-German border many times and stood under the guns of soldiers with orders to shoot. 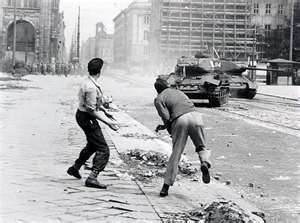 I know people who suffered under the old East German system and who have prospered since its demise. I remember waking up on the morning of November 9, 1989 to see the pictures of jubilant young men and women standing on the wall in Berlin. I remembered being told only a year before this in East Germany that the system couldn’t go on as it was, but neither the person who said this, or I, thought it wasn’t going to go on in just that way. We were wrong. East Germany reunited with West Germany. One by one, the Eastern Bloc countries emerged, blinking, from forty-plus years behind the Iron Curtain. I guess what I am trying to say is, holidays don’t mean anything to you if you don’t know the history behind them. Or they don’t mean what they should. They don’t connect you to the events and people of the past and inform you how these events have influenced one another and created the world in which you live. The peace treaty of The First World War created the Second World War as well as The Soviet Union. Germany was divided because she started The Second World War and then lost it. While many people died as a result of all these events. They died in a thousand different places, in Normandy, in the Ardenne, on Crete, in Galicia, in Berlin, at Stalingrad, in Siberia, or trying to cross the no-man’s-land between the Germanies. Hugging a veteran is a great thing. If my father, a veteran of WWII were still alive, I would have given him a hug today, or my grandfather who fought in France in WWI. Yet, I think we should also do the veterans the honor of knowing more about the conflicts they fought in, whatever they were, the conflicts many of their comrades perished in, for remember you are only a veteran if you make it home again.